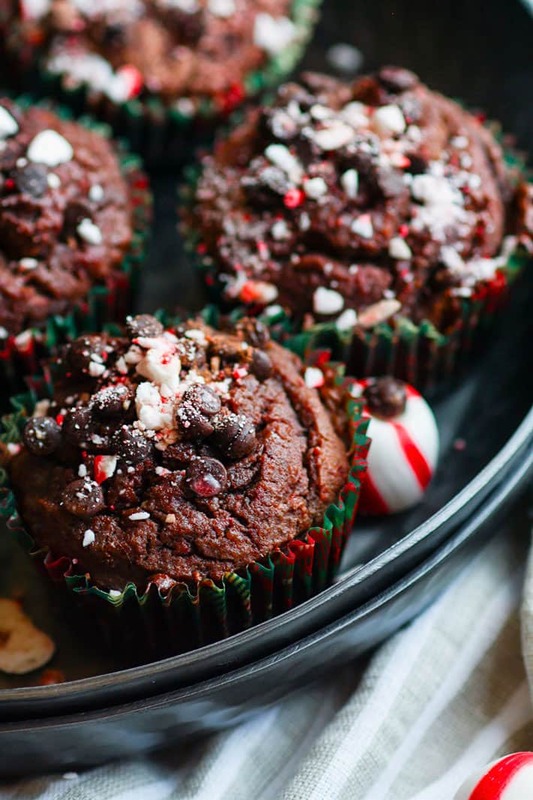 Dark Chocolate Peppermint Muffins with Soothing Peppermint oil! 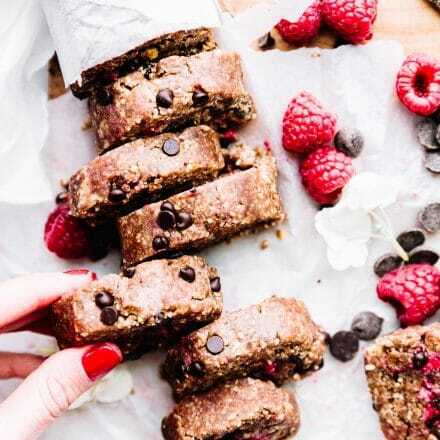 These chocolate peppermint muffins are not only grain free (and paleo friendly), but a healthy and festive way to enjoy breakfast or dessert. 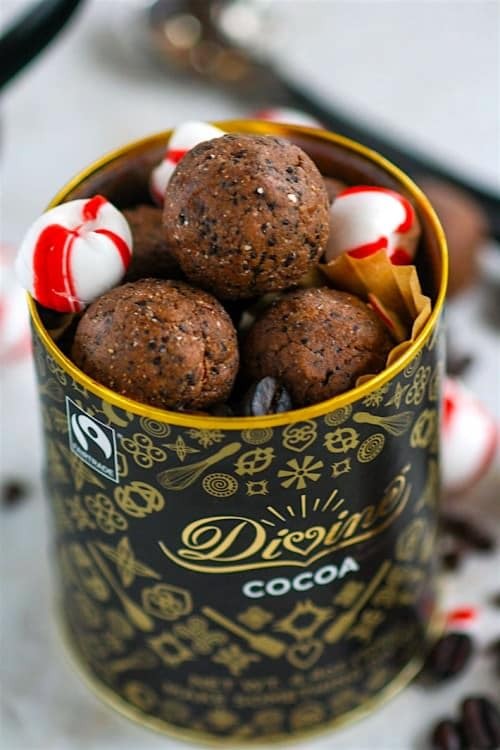 Plus they are a perfect pair for your coffee or hot chocolate, rich dark chocolatey flavor and hints of peppermint. A must make during winter or holiday baking time! Just mix, blend, and bake! Hey friends! Hope you all had a wonderful Thanksgiving and long Holiday weekend. It was cold and rainy here. And confession, I loved it. But also because it was nice to stay cozy inside and not do much, except maybe eat leftovers. You see, I’m beginning to think Thanksgiving is cursed for us Cotters. Haha. Last year my husband got sick and this year, it was me! Nausea, migraine, and blah blah blah. That being said, a low key Thanksgiving and lots of movie watching happened. There might have been a hot toddy involved as well…. just maybe. But let’s talk about these symptoms for a minute. ICK! Do you ever get those waves of nausea of intense migraines? I know it can be common during times of stress or allergies or even lack of blood flow/exercise. And you know what can help ease those symptoms? Well.. PEPPERMINT! As we the holiday season of all things mint, candy canes, and peppermints, we might as well talk about this medicinal herb and all its remedies. This will allow me to justify the use of peppermint in this dark chocolate peppermint recipe, right? Kidding.. kinda. But hear me out for a second, mmm k? Peppermint is actually a hybrid of watermint and spearmint. Yes, two minty fresh mint plants became one POWERHOUSE PEPPERMINT. YAY! But peppermint (both oil and leaf) can be used for so so much these days. And thank goodness, because we could sure use some more homeopathic remedies. Can help ease upset Stomach and indigestion – yes, the soothing peppermint can relax the muscles in the digestive tract as well and reduce spasms. An Anti-Microbial Oil – this means using peppermint oil can help stop the growth of many different BAD bacteria. Like h pylori, salmonella, etc. Can help relieve nasal and sinus congestion. Especially colds related to allergy. If you want to get all all sciency about it, basically peppermint can help produce this. WHich is good for blood flow. How to USE it? Well —> You can rub peppermint essential oils or extract on the temples for a headache and tension. As well as rubbing the oil on sore muscles or chest to open airway. Plus don’t forget that drinking peppermint tea can help tummy relief. All that being said, you can DEFINITELY use peppermint oil or extracts in baking! Which I find even more refreshing… okay actually addicting, but you get my point. But before we get to this recipe. Let’s make sure we know the difference. Deal? Now that we know, here’s how to use peppermint oil in baking, and don’t worry, I gave the extract option as well! NOTE –> Peppermint oil doesn’t dry up like extracts when you add it to a mixture, so it withstands high-heat cooking/baking. And why you don’t need to use as much. In a small bowl, mix your first almond meal, baking soda, sugar, and coconut flour. Blend your eggs, butter, and milk and combine with the almond meal and coconut flour. Mix very well or add everything to a blender and mix until smooth! You can do this in a blender as well if you don’t have a good mixer. Next fold in your cocoa powder, sugar, and chocolate chips. Stir until smooth. Last add your extracts and salt. Pour into baking cups or a greased baking pan until that are about 3/4 full. You can add crushed mint and more chocolate chips to the top before baking or wait till they are out of oven. They stick better if you bake with them. 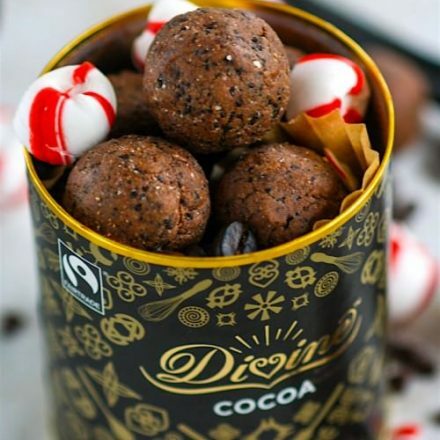 Add more cocoa powder and crushed mint on top! If you don’t have coconut sugar, you can use brown sugar. For more mint flavor in the muffins, use 1/2 tsp peppermint oil or 1 tsp peppermint extract. for less, use 1/4 tsp peppermint oil or 1/2 tsp peppermint extract. 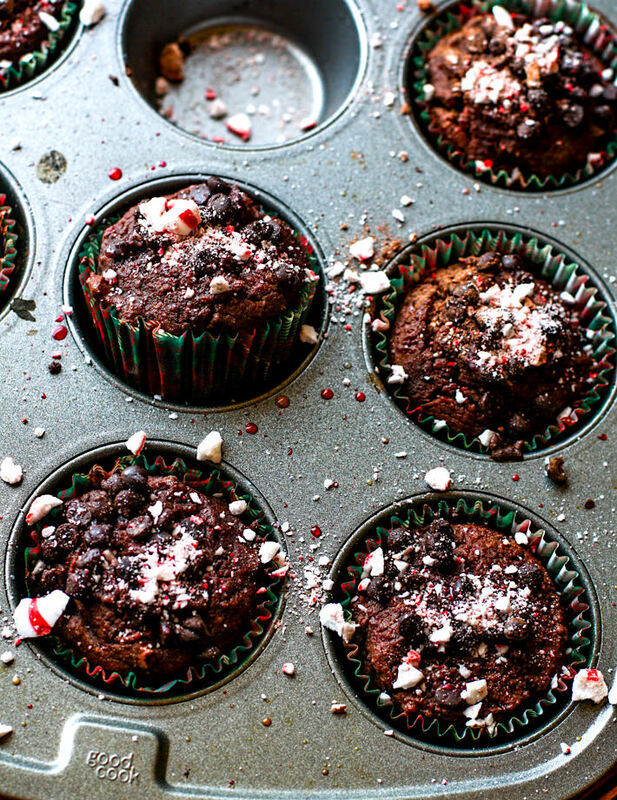 Dark Chocolate plus peppermint plus warm baked muffins = HEAVENLY! Oh and I’m not an doterra rep, but I do buy their essential oils. Love them! 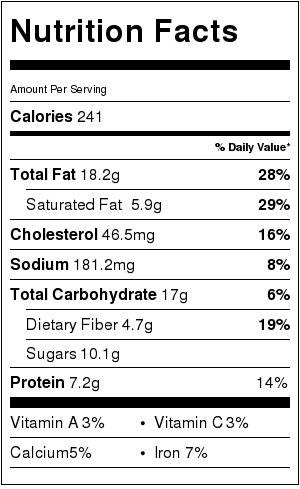 Speaking of.. let’s end this post with another way to use dark chocolate and peppermint. Tis this season, right? Favorite way to use peppermint extract or oil? 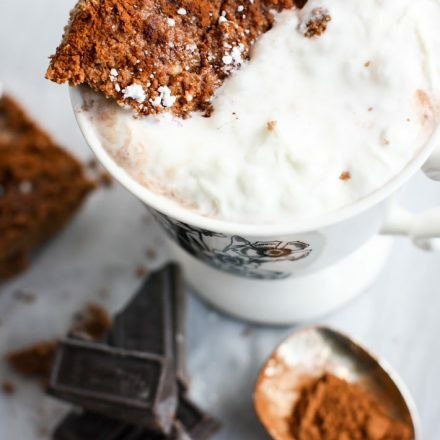 Grain Free Hot Chocolate Brownies – 2 Ways! 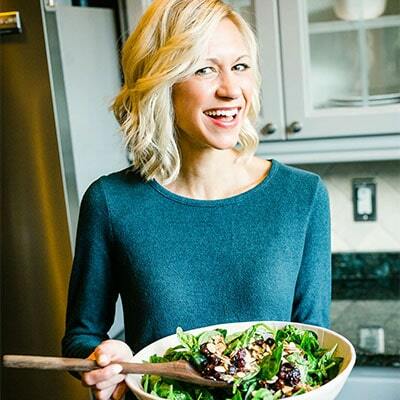 ← COTTER CHRONICLES – Holiday Wellness Edition! I’m so sorry that you didn’t feel well! I got a really bad headache on Friday–luckily not on Thanksgiving proper. I always used to get sick for Tgiving, though–I would get sinus infections every year! Also, award for most festive and decadent looking muffins ever? I think so! peppermint and gingerbread are my two favorite Christmas flavors! That’s all I want in all my food: oatmeal, coffee, pancakes, you name it! My favorite thing ever is making a peppermint mocha latte, so delicious! 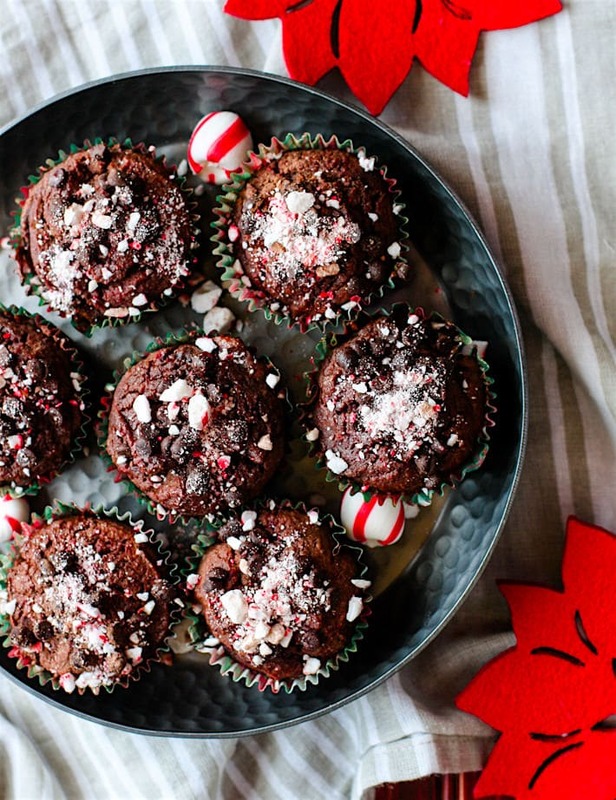 I need tot try these delicious muffins because, CHOCOLATE and PEPPERMINT! I am honestly not a peppermint fan but these look divine and perfect for a holiday party! Pinned for later! Gahhh I love peppermint, and peppermint in muffins for breakfast would go perfectlyyyyy with my peppermint flavored coffee 😀 Overkill? Never. Feel better lady! Oh no! So sorry that you’re not feeling well! I hope that you’re feeling better now that the holiday madness is over 🙂 I have a bottle of peppermint essential oil on my desk that I’ve been staring at for a while because I haven’t quite figured out what to do with it. And now I know. These look amazing! 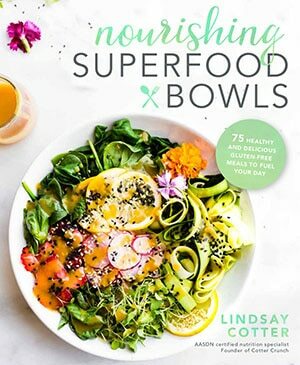 UGH – So sorry you weren’t feeling well, Lindsay! I had no idea that peppermint helped nausea – I have a friend who suffers from sever migraines and I am sending her your post – because I have a feeling she (just like me) wouldn’t turn down peppermint especially when it comes in these mouthwatering chocolate muffins! This muffins look AMAZING. I am such a fan of chocolate and peppermint. Back when dairy and I were friends, I’d enjoy a hot chocolate with peppermint ice cream every year after Thanksgiving lunch, while we watched White Christmas! I do love peppermint oil for headaches too! oh man, i remember those days! haha peppermint ice cream ALL DAY! Peppermint is my lifesavor! (Always have my peppermint tea before bed!) And it does help the tummy SO much! Well then i’m on my way!! Oh yum! Adding these to my baking list! (I need to be careful because peppermint can effect milk supply but I need these!) 😉 I use peppermint oil for sore muscles! maybe if you stare long enough they will magically appear! So you’re saying I can use these medicinally the next time I’m feeling a little holiday bloat, eh? I hear ya 😉 In all seriousness, though… swooning big time over here. Mint chocolate s probably my favourite holiday flavour, and these look absolutely perfect! bring your fudge bars and let’s get our chocolate fix on. k? I love peppermint oil! I make a dark chocolate peppermint green smoothie that is to die for! 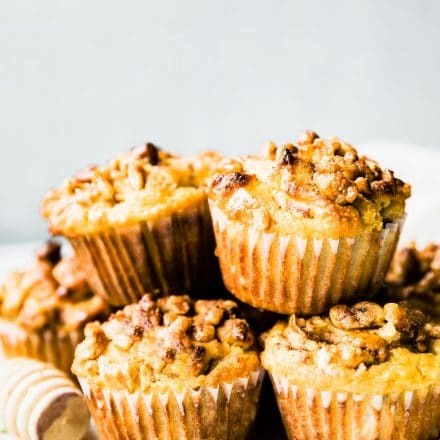 What a perfect muffin flavor – I would love this with a big hot chocolate and a relaxing book! Pinning! OMG i must try your smoothie next! is it on your blog? These are my kind of muffin! I cannot WAIT to give them a try! First of all, let’s just talk about how insanely gorgeous these photos are. My goodness freaking gracious. Now second…. when are you coming to the east so I can have one of these? 😀 I plan on getting my peppermint on this weekend and can’t wait! Haha when are you coming to the south? So sorry you weren’t feeling well, friend :(. We go through about a bottle of peppermint EO a month in this house! Ian and I use it for headaches (especially since I haven’t been able to take ibuprofen and just had a sinus infection ? ), and it was great for first trimester nausea. We also use it for fevers (along the spine), and I rub it on Norah’s throat and tummy for reflux. PLUS, I just added it to some homemade hot chocolate! Which will go great with this recipe ? oh i bet you made homemade hot chocolate, yes? need! p.s. let me know when you come to austin next. I have healthy bites for you! I actually have a peppermint infused oil I rub on my temples when I have stress headaches. It helps, and I’m sure it would work equally as well in these muffins. Plus chocolate…holy YUM. yes, lesson ALWAYS learned.. on repeat. haha. How are you? I LOVE peppermint. I use it for everything and can’t live without my Doterra peppermint oil. I use it on my temples for headaches, use it for nausea and I love it in my mochas or for baking! You nailed it! Thanks so much friend. ❤️?? Man oh man, these might have to be on my to-do list to take with us this weekend! These look so gorgeous and festive! I wish I had such talent. But alas, my food pics are always un-staged and taken in a hurry with my iphone. Just one of many reasons why I shall never be a food blogger…. And I feel like I say this on all your posts – but you holiday treat recipes are making my newly GF heart so VERY HAPPY!! I hope you feel better soon! 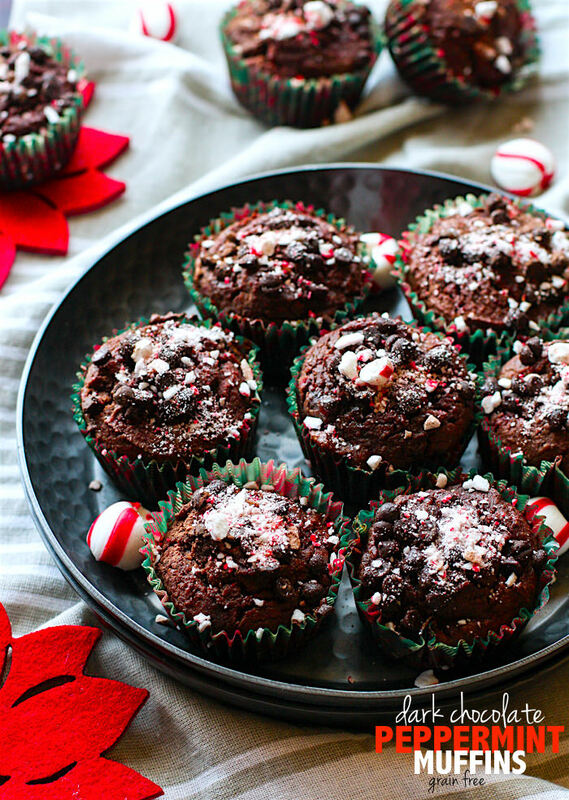 I love peppermint and chocolate together and these muffins look divine! Glad you are on the mend! 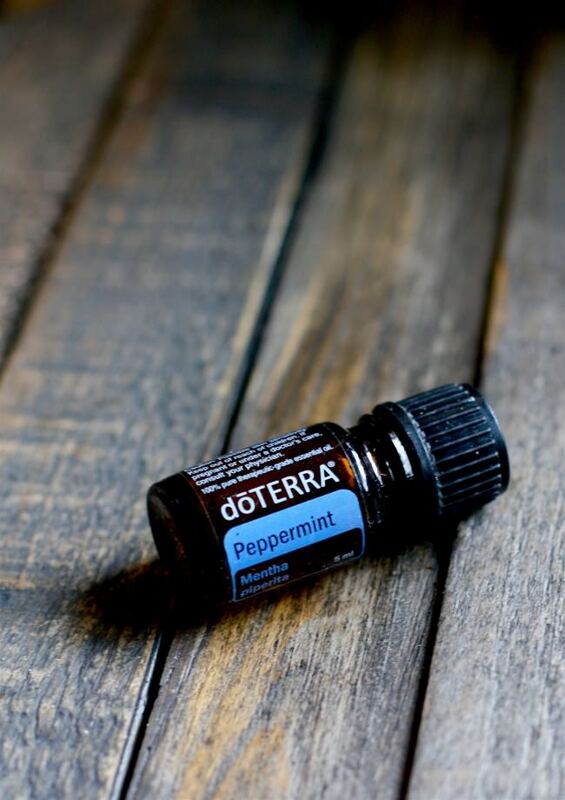 I love adding peppermint to everything especially this time of year. And peppermint tea is the only kind I like. And these muffins look ah-maz-ing! you just reminded me, i need more peppermint tea! I’m so sorry that you were sick over Thanksgiving! I feel like that may be the worst holiday to have nausea with all that food around! I’ve heard so many good things about essential oils. I really need to give them a try. Especially with this recipe! chocolate and peppermint is my favorite combination! haha i know. I definitely avoided the food till I was able to eat. I am not a peppermint fan but these are so darn CUTE & festive!! Great for other peeps! Course mine would not look like this! 🙂 I did not know this about peppermint!!!! I hope you are feeling better. I am a big fan of peppermint. Your muffins look perfect. I really like the information you shared about peppermint. I didn’t know that it could help with nasal congestion. You can totally is peppermint Extract too! I did an avocado mint smoothie one time and it was delish! I’m sure I’d love this recipe too 🙂 so festive! Ohhh that’s a good combo! yay, me too! glad you like MEgan! Sorry your Thanksgiving was not feeling perfect 🙁 I love peppermint and heard it was good for nausea but didn’t know about headaches. Good information to know and even better would be eating one of these muffins. peppermint sure does wonders. Love it in baking! Thanks for the kind words stephanie.